Hi all! As part of the Indie Designer GAL we get to interview other designers, often new to us. 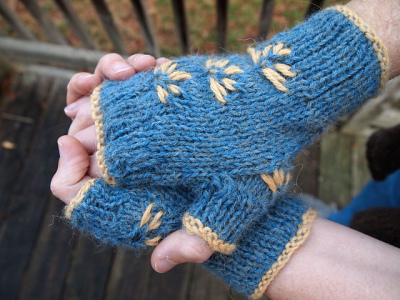 For this installment, I got to interview Naomi Parkhurst, Gannet on Ravelry. Steph: Hi Naomi! Thank you for participating in the GAL. What are your favorite items to knit for gifts? 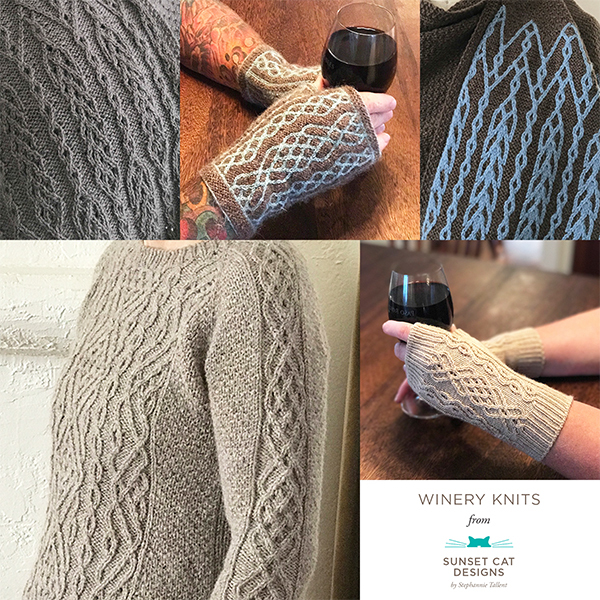 Naomi: I’m very fond of knitting hats and fingerless mitts – they go very quickly and can have interesting details added in easily. They’re also relatively forgiving when it comes to fit. I don’t have many patterns out yet. Most of them would be suitable for presents, as I’ve only published small things and accessories so far. The quickest to knit would have to be my Sanguinaria yarn bag – a good gift for knitters! Popular is hard to define, since some of my patterns have lots of favorites and purchases, but very few projects attached, but I think the two that have had the best reception so far are Pinion and Bread & Roses. The pattern I’d love to see more people make is Katherine Whorl, a combination of equal amounts of knitting and crochet. I think people have been a little intimidated by the combination. The knitting is basic knit and purl in the round (there are instructions for replacing this with crochet), while the crochet is the Catherine Wheel stitch and also some surface crochet. Any new designs for the GAL? if not, anything in the works you can tell us about? I don’t have any new releases yet this month, but I hope to have one or two during the course of the GAL. One is a hat recipe using my secret code stitch pattern technique. You can see a sneak peek in my projects. (There will be a better pattern photo when it’s released). The other is a re-release of my Bull City Yarn bag, which needs some tech editing first. (I noticed from Naomi’s blog she’s on Patreon, a platform for folks to support artists via a monthly subscription.) And also, tell us about Patreon — how is that working for you? Oh, good question! I’m very happy with my progress so far and think it’s been worth doing. I’ve been able to raise money to help me pay for blog-related things I couldn’t otherwise manage. It’s also helped me stay motivated to post on a weekly basis. Every month I take requests from my Patrons for words to encode as stitch patterns, pick a word at random to turn into a stitch pattern, and then put the results up on my blog as an extra post for everyone to enjoy. It’s been even more enjoyable than I’d hoped – it’s fun to take requests and my Patrons think up very different words for the purpose than I would. It’s not earning me a lot yet, but it’s been growing steadily, and I hope to make some more progress toward my next goal: getting enough donations to help me pay for my own website instead of having my blog hosted on WordPress.com. In the long run, I’m hoping that Patreon will help me earn a reasonable wage for the hours I spend blogging without having to take out ads.